The currency was selling above par at the small exchange shop. The man spent most of his life chasing the almighty dollar. The man who was asking for donations for the charity was as phony as a three-dollar bill. The young mother is as poor as a church mouse and she has little money to feed her family. The company president believes that his business is as sound as a dollar. The tickets for the final basketball game were selling at a premium. We plan to send our child to a good school at all costs. The small business owner works very hard to balance the books of her company. The government bonds were selling at a price that was below par. We are betting on the wrong horse if we continue to support the other candidate for mayor. The young man was living beyond his means before he got his first job. The new student in our class was born with a silver spoon in his mouth and has had an easy life. The man spent his bottom dollar on some new clothes to wear for his job interview. The value of the company's stock has recently appeared to bottom out. The man's business is his bread and butter and he works very hard to make it successful. The man broke the bank at the casino and walked away with much money. The money was burning a hole in the man's pocket when he decided to go to the casino. The man tried to buy off the politician but the politician refused to agree to the plan. I was able to buy my first house for a song. I paid for the hotel room by check. I believe that we can take the new business plan to the bank. I cashed in my savings bonds in order to get some money to buy a car. The former basketball player cashed in on his popularity to open a very successful restaurant. I decided to cash in my chips and go back to school. I gave the salesman cash on the barrelhead for the used car. My friend is a cheapskate and will not go to a movie with me. The amount of money that I paid for the used car was chicken feed. Everybody in our office chipped in some money to buy a wedding present for our boss. The criminal tried to chisel the small business owner out of much money. I cleaned up at the horse races last year and I still have some of the money left. The man is closefisted with money and will not spend it. My sister controls the purse strings in her family. The accountant was cooking the books for more than one year before he was caught. It is going to cost a pretty penny to get my car fixed. My new television cost an arm and a leg. We had to cross the apartment manager's palm with silver in order to rent the apartment. The owners decided to sell the soccer team in order to cut their losses. The company cut me a check to pay for my extra work. The wealthy businessman cut his son off without a penny when the young man refused to work hard. Recently, the government is trying to solve the problem of deadbeat fathers who do not support their families. Used computers are a dime a dozen and they have little value. The land was dirt cheap when we bought it. My friend was down-and-out for many years before he got a job. We put the money into our bank account so that it would draw interest. The movie was a Dutch treat so I did not have to pay for my date. I was able to make some easy money from my job during the summer. The face value of the stamp was very low but it was worth a lot of money. The company tried to make a fast buck on the property but actually they lost a lot of money. Everybody had to feed the kitty in order to collect money for the party. I am flat broke and do not have enough money to pay my rent. I decided to float a loan to get some money to buy a car. A fool and his money are soon parted and when the young man got the money from his father he soon spent it. My sister will foot the bill for her daughter's education if she decides to go to university. We bought the car for a song and will use it on our holidays. I would not want to have that man's job for love or money. "For my money, I believe that the new company policy will not be successful." The man had no money and was willing to work for peanuts. I had to fork out much money to get my car fixed. I forked over much money for the painting that is hanging on my wall. Our neighbor owns his house free and clear. The man went from rags to riches with his hard work. The man got a run for his money when he decided to volunteer for the cleaning project. The woman was forced to get along on a shoestring when she was a student. We got our money's worth when we were able to spend the day at the water park. The city gave the new department a blank check to try and solve the homeless problem. The young candidate for the city park board gave the more experienced candidate a run for his money during the election. We decided to go Dutch when we went to the restaurant for dinner. I do not want to go to the expense of buying a new sofa for our apartment. The going rate for used bicycles is not very much. The job was a gravy train and I made a lot of money when I worked there. We had to grease the palm of the hotel manager to get a room. The bus company has received many handouts from the government. The man is always hard up for money and he often wants to borrow some. The hotel clerk has an itchy palm and he is always asking for money. My aunt has money to burn and she is always travelling somewhere. The clerk had her hand in the till so we decided to fire her. My uncle has the Midas touch and every business that he starts makes a lot of money. My friend does not have two cents to rub together and he is always broke. He who pays the piper calls the tune and the owner of the sports team can decide who will play on the team. My cousin is head over heels in debt and has no money at all. The referee threw the coin to see if it would be heads or tails. We hit the jackpot at the casino and came home with much money. The bank refused to honor my check for the apartment rent. The ill-gotten gains of the politician were the subject of a large government inquiry. My aunt and uncle have been in clover since my uncle got his new job. The man is in debt and owes much money to many people. I paid for the work on my car in kind rather than with cash. Our company has been in the black since it started. My grandfather was in the chips after they discovered oil on his farm. I think that we are now in the hole and our business is having trouble. I am in the money now that I won the lottery. The company has been in the red for several months now and may soon go bankrupt. The store jacked up the prices of their summer stock at the beginning of the summer. Our accountant is keeping careful books of all the transactions in the company. My job does not pay very well but it is enough to keep the wolf from the door. The politician received several illegal kickbacks and he was forced to resign. The man is pretending to be the last of the big spenders as he spends money during his holidays. I am trying hard to lay away enough money to buy a car. I had to lay out a lot of money to get my car fixed so now I do not have much money. We bought our furniture on the layaway plan at the store. Consumers of electronic products should remember the motto of "let the buyer beware," when they buy something. The girl is living beyond her means and will soon have some serious financial problems. My friend has been living from hand to mouth and is now using his savings from his previous job. I try very hard to live within my means so that I do not have any financial pressure. My uncle is loaded and has lots of money. The woman looked like a million dollars when she went to accept the award. The new coffee shop is losing money hand over fist. I lost my shirt in a small business and now I have no money. I am not made of money and I do not like wasting it on stupid things. I made a bundle on the stock market and decided to buy a house. I made a check out to the man who repaired my bathroom. The young man is very lazy and he is always trying to make a fast buck. The man works hard to make a living and support his family. I have been having trouble making ends meet because the rent for my apartment is very high. My friend makes good money at his new job. The money is burning a hole in my pocket and I want to spend it. 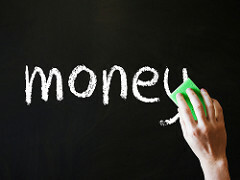 Money doesn't grow on trees and it is necessary to work hard and manage it well. Money is no object and I plan to stay in the best hotels during my holiday. - you think that someone will win a competition or sports event etc. My money is on the young horse that is racing for the first time today. 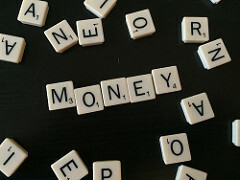 Many people believe that money is the root of all evil and that it causes people many problems. Money talks and when I go to a restaurant with my rich uncle we always get very good service. I made a nest egg when I was working and I am now able to go to school. The small repairs on my car are beginning to nickel and dime me. I will not meet with that woman again for love nor money. I had to turn my car on a dime after I entered the parking lot. My cousin started his business on a shoestring but now it is very successful. I bought the new stereo on credit. The DVD's were on sale when I bought them. All of the drinks at the restaurant were on the house. Our estimate of next year's budget is right on the money. The agent at the border crossing seems to be on the take. My out-of-pocket expenses for the business trip were very low. The plumber who was fixing our plumbing system was padding the bill so we got a new plumber. Our supervisor always passes the buck and he will never take responsibility for what he does. We passed the hat to collect some money for the party. I had to pay a king's ransom for a ticket to the final basketball game. I will have to pay as I go if I go to graduate school next year. I must pay in advance for the bus company to deliver my boxes. The owner of the store had to pay off the gang who were threatening him. I paid off my student loan after one year of work. The young girl paid her own way through college. The student wasted most of the term playing. He was forced to pay the piper when the professor assigned much work at the end of the term. I had to pay up my parking tickets or I would lose my driving license. The mayor received a payoff and was forced to resign from his position. The money that I received from the government was like pennies from heaven and I was very happy. "I will give you a penny for your thoughts," I said to my friend who was looking out of the window. The man is a penny pincher and will never spend any money. A penny saved is a penny earned and it is better to be thrifty sometimes than to only work more hours. My friend is penny-wise and pound foolish and she economizes on small things but wastes much money on big things. I picked up the tab for my sister and her children at the restaurant. The small boy saved much money in his piggy bank. My grandmother always pinches pennies and never spends her money foolishly. My father likes to play the market and he sometimes makes a lot of money. I had to pony up a lot of money to get my car repaired. The man is pouring money down the drain by always repairing his old car. I stood up in the meeting and put in my two cents worth before I sat down. I was forced to put my money where my mouth is and either go to Europe or stop talking about it. The young man often puts the bite on his father before the weekend. The small company is only interested in making a quick buck and is not interested in product quality. I asked the salesman to quote a price for the new product. I decided to take a rain check and will go to the restaurant with my friend another time. The union raised the ante with the company when they said that they were going to go on strike. We have been raking in the money at our restaurant since it opened. The cashiers were raking off some of the money from the store. I would not give a red cent for my neighbor's car. The man is rolling in money and he always has much money to spend. My uncle salted away thousands of dollars before he died. I am saving up for a new television set. We scraped together some money and bought a present for our friend. The woman has been scrimping and saving to buy a new car. I will not give the man the product until I see the color of his money. The gang tried to shake down the owner of the small store. My sister is sitting on a goldmine with her collection of antiques. The smart money is on the government to introduce the new law this week. I am trying to sock away some money for my holiday. My friend is spending money hand over fist. I went to the small store to square accounts with the owner. I was able to squirrel away much money from my previous job. My friend is stone broke and will not be able to come to the movie with us. I am strapped for cash at the moment so I will not be able to go on a holiday. The company was able to strike gold with their new product. My grandfather struck it rich when he was young but when he died he had no money. My friend took a beating on the stock market and has now stopped buying stocks. I plan to take the money and run as I do not believe that I will get any more money for the settlement of my car accident. We plan to take up a collection for the wife of the dead manager. I do not want to throw good money after bad so I will not pay any more money to fix my car. The government is throwing much money around as they prepare for the large exhibition. The city plans to throw a lot of money at the project to fix the stadium roof. I was able to get a tidy sum of money from the sale of my business. We decided to tighten our belt and try to save up some money for a holiday. My uncle is very tightfisted with money and does not want to spend any at all. Time is money and I do not want to waste time talking to our supervisor because she always wants to argue with me. The small car is very flexible and is able to turn on a dime. The newspaper cost two bits a copy. I gave my two cents worth when my supervisor asked me for my opinion. The company upped the ante in their bid to buy the other company. The antique desk is not worth a dime although everybody thinks it is very valuable. The new secretary is very smart and she is worth her weight in gold. The antique desk is not worth a dime although everyone thinks it is very valuable. The antique desk is not worth two cents although everybody thinks it is very valuable. My sister's husband is (in good financial condition) after many financial problems last year. I spent my (last small amount of savings) on a ticket for a basketball game. I decided to (sell all of my belongings) and go and work overseas. I was (out of money) at the supermarket and I could not pay for my groceries. You can often buy used pocket books for (a very cheap price). I was (without money) many times when I first started working. My neighbor seems to be (short of money) at the moment. Our company has been (losing money) for over three years now. My friend made (a lot of money) when he was working in the oil industry. We were able to buy the house (very cheaply) so we decided to try to buy it immediately. My sister went to Las Vegas and (won a lot of money) at the casino. That man is (very rich) but he never likes to spend his money. The company president received (some illegal money) from the contractor who wanted to get the building contract. My father (lost most of his money) on the stock market. The family has (more money than they need) so they often go on a nice holiday. The drinks were (paid for by the owner) as it was the tenth anniversary of the restaurant. The woman is always (very careful with her money) and keeps a very strict budget. I had to (pay) some money for the health club fees when I joined the club. My friend asked me how much my new car had (cost). I tried hard to give my (opinion) but I was unable to do so. I had to (live on less money than usual) after I quit my part-time job. When I got an increase in salary I (spent some extra money) on a big meal. We were able to (save) enough money to pay for the new kitchen in our house. I will take a (promise to meet again) as I cannot go to the movie with my friend tonight. The little boy has been putting money in a (small container) to save for a new bicycle. The salesman was (putting false expenses) on his expense account so we decided to fire him.